Michael Jung sealed a £240,000 Rolex Grand Slam on La Biosthetique as he became the first German to win a Badminton Horse Trials title. Jung, 33, had already won at Burghley and Kentucky and completed the treble with a flawless showjumping performance in Sunday's final event. Fellow German Andreas Ostholt finished second on So Is Et, with Britain's Gemma Tattersall third on Arctic Soul. Jung is the second winner of the Grand Slam, emulating Pippa Funnell in 2003. "I think we need a bit of time to realise this very special moment. It's a very big situation," he said. Zara Tindall achieved the Olympic qualification mark on her way to a 23rd-place finish aboard High Kingdom, the horse that took the Queen's granddaughter to team silver at London 2012. Team GB places will not be announced until July but Tattersall has hit the qualifying standard, alongside Tindall, Kristina Cook (seventh on Star Witness), Izzy Taylor (eighth on Allercombe Ellie) and Ben Way, who came 12th on Galley Light. Jung led after each discipline - dressage, cross country and showjumping - and finished with 34.4 penalty points, a record low at Badminton Park. Ostholt was on 43.4 and Tattersall had 44.6. Tattersall - who had previously finished no higher than 16th at Badminton - made a firm case for Olympic selection. She flawlessly cleared all 13 obstacles in the showjumping finale, as did Ostholt and Jung, ensuring the places stayed the same as at the end of Saturday's cross country. Such was Jung's lead, he could afford to knock down two poles on his final run but sailed through unblemished to earn a standing ovation from a sell-out crowd. Jung will now be a firm favourite to retain his Olympic individual eventing crown and possibly lead his nation to a team title in Rio. 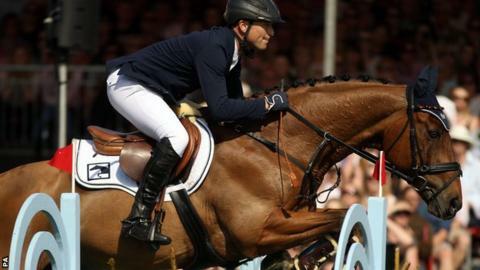 He spoke of La Biosthetique's trust and called the horse "the best in the world" on Saturday - perhaps unsurprising considering the pair became the first horse-rider combination to hold Olympic, world and European titles in 2012. Ominously for Great Britain - who finished second in team eventing at London 2012 - Jung looks to be in relentless mood as he broke a Badminton points record set in 2006. He also became the first rider to lead from dressage through to conclusion since 2007 but it is the fact he is just the second rider to win a Grand Slam which will make Badminton 2016 live long in the memory of eventing fans. Todd set for seventh Olympics at 60? In all, 46 of the 77 horse-rider combinations which started the week made it to the conclusion. A strong New Zealand contingent saw Sir Mark Todd place fourth, raising hope he could compete at a seventh Olympic Games at the age of 60. Todd won individual gold in 1984 and 1988 with a team bronze in Seoul and further bronzes in 2000 (individual) and 2012 (team).